Businesses and industries that we deliver the most power to: Appliance Repair, Plumbing, Contractors, Electricians, Garage Door Services, Gutter Services, Handyman, Movers, HVAC, etc. Main Features: job management, invoicing & online payments, analytics & marketing, customer tracking, incredibly fast experience, helpful modules, professional support, always up to date, constant improvements, inventory & orders and smart analytics module. Businesses and industries that we deliver the most power to: Appliance Repair, Heating & Air Conditioning/HVAC, Plumbing, Home Cleaning, Landscaping, Electricians, Handyman, Movers, Garage Door Services, Home Inspectors, and many others. Scheduling Suite Reviews Recently Reviewed! Switched to Scheduling Suite from another software because of load time and better experience. Pros: The app I used before was good enough for my appliance repair business. It got slow though and sometimes it could take long seconds to open a page. Once I tried Scheduling Suite it seemed unbelievably fast. My entire team is happy and like the app. I also use their analytics module, which I found to be quite interesting. It helped me a lot to see what job and how many come from the new location I recently opened. Highly recommend to appliance repair business specifically. Cons: Nothing. Software is working as expected. Overall: Save me money. Immediate support. Support different companies in one user account . Pros: The app is fast and very easy to understand and use. It features everything I need for my day to day use. I keep all of my clients and invoices and I use their addon to calculate my income, which gives me transparency on what my true income is. Additionally, support has been great and I found a way to manage the app the way it is super helpful. Great experience overall. Cons: It wasn't specifically designed for my category - beauty, but I found lots of workarounds and found the app be kind of flexible to meet needs out of this app scope. Overall: All of my contacts, appointments, and payments are well organized and can be accessed from anywhere and from any device. Great app. They can do custom development. Great app. They can do custom development. Great app!! Pros: I was referred to this app by my friend to organize day to day operations in my roofing company. Great and fast app so far, no concerns. Working with their development team to add more functionality to meet my personal needs. 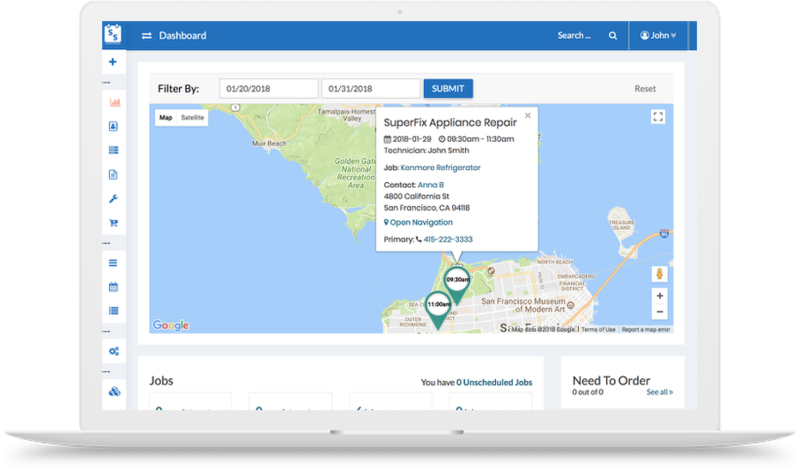 I liked how they did a good job to personalize it as an appliance repair application, so came up with my own suggestions to make it a very roofing software with custom features. It was awesome to know that they can do some custom development on top of what they already have. Cons: No concerns so far, I love the application and I'm planning to continue using it in the near future. Pros: Well, it was designed for appliance repair business at the beginning. This app has something that none of other apps would ever have, I believe. I can specify appliances, brands, build a list of parts that needed to be ordered once I stop in an appliance store. It gives an ability to attach parts and orders to each job. It is simply perfect! Cons: I use this tool each day and still did not notice any major cons so far. The buttom line - its worth trying.